Curly-leafed pondweed gets its name from its rippled, wavy, and crinkled submerged leaves, growing in water up to 15’ deep. The leaves are often compared to small lasagna. It has small “teeth” along the leaf edge. Curly-leafed pondweed can be an aggressive invader that can cover large portions of lakes. It is a non-native plant and should be eradicated as soon as possible. In early summer of 2006, we found and pulled out one patch in Waccabuc. In 2007 and 2008 we’ve found growing plants in a Waccabuc cove and a stand at the west end of Oscaleta. Please keep an eye out, report any new infestations, and pull all that you can! Young curly leaf pondweed plants can form under ice cover during late winter, which makes this invasive one of the first nuisance aquatic plants to emerge in the spring. 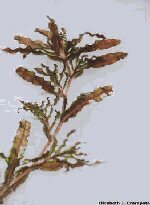 Curly leaf pondweed spreads in many ways: turions, which look like small brown pine cones, are dispersed by water movement; established plants form large colonies from rhizomes; and curly leaf pondweed can also spread by fragmentation. Impacts: Curly-leaf pondweed is a highly competitive plant, capable of rapid growth and spread. Infestations may displace native species, reduce biodiversity, impede recreational activities, and reduce property values. As the dense mats of vegetation decay, available oxygen in the water may be depleted. The resulting anoxic (low oxygen) conditions may lead to fish kills and harm other aquatic organisms. Nutrients released from the decaying plant matter may also contribute to cultural eutrophication and algae blooms. At the early stage of infestation, we may be able to control this by hand harvesting. Pull it out by the roots, carefully collecting all the pieces and dispose of the weed away from the water. This plant most likely came to our lakes as a “hitchhiker” on a boat. Please ensure you carefully inspect all boats or water toys that come into our lakes. Also please be careful to dispose of unused bait appropriately. This is the dominant plant at Lake Katonah, and they use herbicides annually to control it. LIFE HISTORY AND EFFECTS OF INVASION: Curly-leaf pondweed spreads through burr-like winter buds (turions), which are moved among waterways. These plants can also reproduce by seed, but this plays a relatively small role compared to the vegetative reproduction through turions. New plants form under the ice in winter, making curly-leaf pondweed one of the first nuisance aquatic plants to emerge in the spring. It becomes invasive in some areas because of its tolerance for low light and low water temperatures. These tolerances allow it to get a head start on and outcompete native plants in the spring. In mid-summer, when most aquatic plants are growing, curly-leaf pondweed plants are dying off. Plant die-offs may result in a critical loss of dissolved oxygen. Furthermore, the decaying plants can increase nutrients which contribute to algal blooms, as well as create unpleasant stinking messes on beaches. Curly-leaf pondweed forms surface mats that interfere with aquatic recreation. CONTROL METHODS: Turions and plant fragments can be carried on boats, trailers, motors and fishing gear from one water body to another, thus proper prevention techniques are essential to curb the spread of this aquatic invasive. An effective prevention and remediation program also addresses the overall health of a waterbody: Maintaining a healthy ecosystem with diverse native aquatic plants and animals as well as minimizing nutrient and ollutant inputs will deter invasions. Once introduced, curly-leaf pondweed spreads rapidly. Long-term management requires the reduction or elimination of turions to interrupt the lifecycle. DNR permits are required for chemical treatments, mechanical treatments, some manual treatments, biological control, bottom screening, and buoy/barrier placement. Manual/Mechanical Control: To have the maximum benefit, manual/mechanical control efforts should be undertaken in the spring or early summer. Mechanical control includes raking, hand-cutting or harvesting vegetation. Raking and hand cutting remove plants at the sediment surface, and there is some evidence that early season cutting of pondweed can prevent turion production. Harvesting generally removes the top 5 feet of the plant. Curly-leaf pondweed can spread from plant fragments, so it is important to clean all vegetation off boats and equipment before leaving water access. Chemical Control: There are a small number of aquatic herbicides that can be used to control curly-leaf pondweed. In Minnesota, good to excellent control was obtained using formulations of diquat (Reward) and endothall (Aquathall K). These chemicals can be used in small areas and will usually knock down curly-leaf pondweed within 2 weeks. The best time for treatment is in spring or early summer when natives are still dormant and temperatures are low enough for endothall be effective. In early experiments with fluridone (Sonar), production of turions was completely inhibited following early season treatments. Fluridone usually has to be applied to an entire lake and requires 30 days to knock down curly-leaf pondweed. Habitat manipulation: Habitat manipulation such as drawdowns and dredging can also be used to manage curly-leaf pondweed. Fall drawdown can kill the plants by exposing them to freezing temperatures and dessication. Dredging can be used as a control by increasing the water depth. In deep water, the plants do not receive enough light to survive. This method can be detrimental to desired plants, as all macrophytes would be prevented from growing for many years. This high level of disturbance may also create favorable conditions for the invasion of other invasive species.